Discussion in 'Map Factory' started by zpqrei, Jan 10, 2010. It's just a quick block out. Fastest block out...ever. Does it have the 4 Required novint stuffz? Not yet. It has two crates, though. It doesn't neeeeed them until the final version submitted at the deadline. I'm trying to keep my alphas as small (filesize) as I can. The location of the intelligence seems illogical, other than to have two flags on opposite sides of the map, and it's very easy to turtle. Mid size seems alright, though it would be nice if there were was some way to get from the water up into the buildings that didn't involve going back into the bases. The bases themselves are wayyy too big. If this were a cp map, they could easily hold two or so separate cap zones. 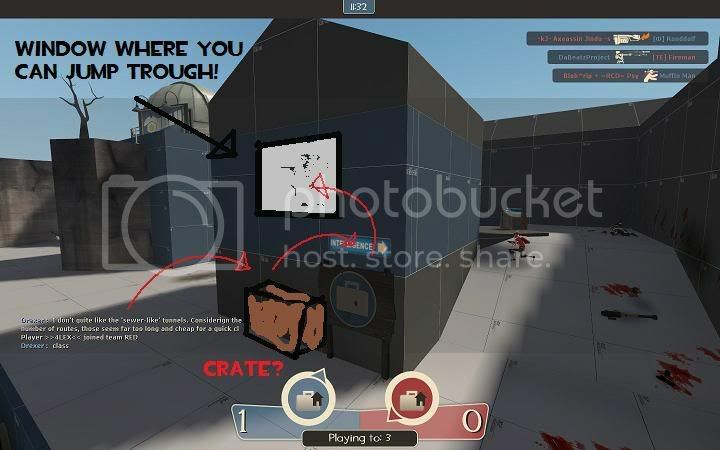 Condense each teams area, and move the metal and health right by the flag, no need to make it easy for people to sentry camp there. I recommend removing the ammo at the intelligence entirely. it would be a great use of those Novint Crates. This. Perhaps a bunch of crates/barrels near a wall that any class could use to jump back up in 2 seconds? I have to say, besides the huge size, I greatly dislike those sewer-like tunnels leading to the mid. They end up giving a very similar vibe to the 2fort sewers, and they are basically an incarnation of the whole superfluous distance of the map. And I fully support an opening in the shack near the intel, so that any demoman can lay waste to everything beyond it. -Need a deeper part on the water(I recommend to a side of the central bridge, one for each team). 10th January 2010: Alpha 2. Added heath under the middle bridge. Removed little barriers and non-team colour-sided barriers on mid. Made battlement sniper nest room bigger to make map simpler. Made water cheap to improve FPS. Added ramp from water to mid houses. Added route via crates from outside to intel with new window. As has been said a countless amount of times, it's too long, and IMO, a bit narrow. Ah yes, I will fix that. The map seems to work well, but there were a few navigation issues among players and nobody was coming in to contact with enemies until we reached 8v8. Not too much to say about the map just yet, but it looks promising! If you can get a3 out by the end of today, I expect this map to be finished by the end of the month. how can you be so fast? I am not even done blocking out my design, let alone have a first alpha.